Tired of DCOM issues complicating connectivity between your OPC systems? Or looking for an easy solution to secure your OPC communications? OPCNet Broker DA HDA is the right solution for you. This OPC Tunneller is an OPCNet Broker’s DA HDA component. In fact, it ensures fast‚ reliable‚ and secures OPC remote communications, without the usual frustrations involved with DCOM configuration. 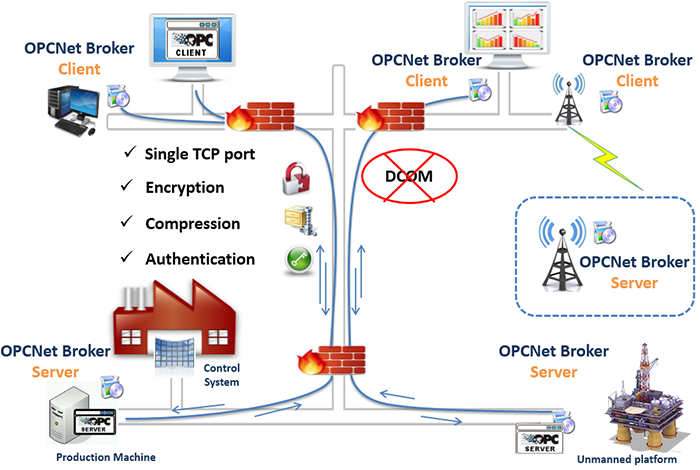 OPCNet Broker DA HDA secures communications with the control network using a single port through a firewall. It ensures the data integrity by using data encryption to prevent attacks from hackers. Moreover, it is robust against network glitches by providing automated reconnection mechanisms and data compression features. This, consequently, reduces the costs and strains on your network during data transfers.